The C-1U USB Studio Condenser Microphone from Behringer is well suited for capturing vocals and instruments in digital recording environments. It features a USB output for plug-and-play style recording with a laptop or desktop computer. The USB output allows you to record using your preferred software without interfaces or preamplifiers. This low-noise condenser microphone contains a cardioid pick-up pattern for reducing ambient room noise and feedback. The C-1U can be used in a wide range of situations, including vocals, piano, guitar, and amp-cabinets. It includes a swivel mount and a USB cable. The C-1U features a 40Hz to 20kHz frequency response for accurate reproduction of vocals and instruments. 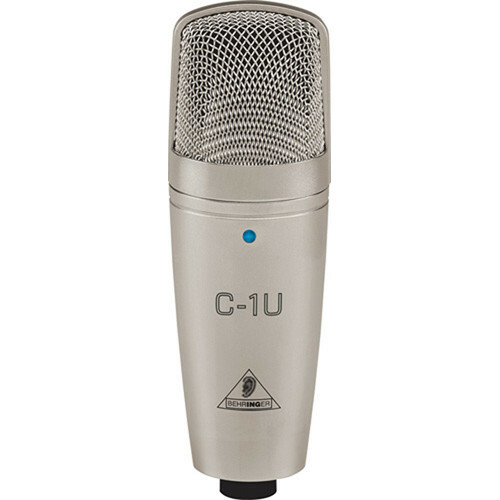 Box Dimensions (LxWxH) 10.7 x 7.0 x 3.3"
C-1U USB Studio Condenser Microphone is rated 4.0 out of 5 by 18. Rated 1 out of 5 by Anonymous from dont buy the recording volume was super low...i turned every vol to max, i tried changing drivers, still no hope. I checked online, and so many ppl have the same problem, and there seems to be no solution so far. it may have something to do with the usb power supplying level fact. i will be returning this asap. ive tried samson c01u on my same pc before and it sounds much much much better. Rated 5 out of 5 by Anonymous from Awesome Mic! I had read all of the reviews for the C-1 on quite a few different sites, but really just wanted a quick connect USB versus purchasing an additional power supply for the C-1. This was my first prosumer type mic, and the sound quality difference is amazing compared to the cheap $20 computer mics I had been using in the past. I purchased a Samson stand and shockmount, along with a pop-mic to complete the package. I can't believe I waited so long to purchase a good mic! The setup does take up some desktop space, so be prepared to make some room. Rated 4 out of 5 by Anonymous from Great mic but no stand My son plays guitar and uses the microphone to record his music directly on the computer. The microphone provides excellent recording quality but has no stand included. If it had a stand it would have been a solid five stars! Rated 5 out of 5 by Anonymous from Son says it's a great mic. Son says this mic was easy to install (usb) and sounds great. Mom is a singer and likes the quality too. Good deal! Rated 4 out of 5 by jim the runner from High Quality Mic We use this with Audacity to record voice/piano/trumpet - it does a fine job with just a bit of tweaking. Rated 4 out of 5 by Anonymous from Good cheap condenser Was used as part of a Burning man project, it handled the dust and noise as needed. I'm using C-1U, but I get a lot of noise. Not a baground one, but as there is an old tv set tunned in no channel (like in Poltergeist movie). Like a Xcchhxhhchchehxhhhch sound. I've already tried other USB, recording level sets, other computer and other room. What can I Do? sorry, i dont have a lot of knowledge,used it a few times,no problems at all.try to download Audacity - its free - maybe there was some noise cancellation.good luck.